You are currently browsing the tag archive for the ‘Callistemon’ tag. 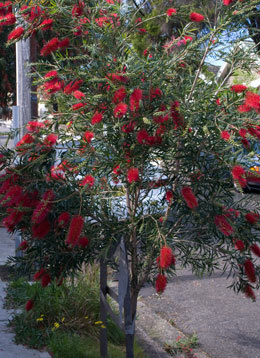 This species of Callistemon has been used as a street tree all over Marrickville LGA. They flower twice a year & the flowers last for many months. The photo below clearly shows the difference in flower size & colour between this & the newer Callistemon species that is being planted now. As I write this post, the air is full of the song of feasting Lorikeets. It sounds wonderful & lasts for much of the day. 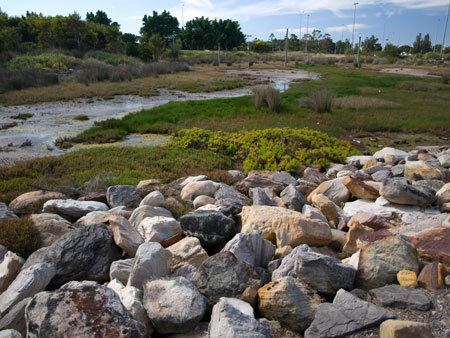 Marrickville Council planted some new Bottle Brush trees (Callistemon) in the area last year, about which the community was very pleased, especially as Council removed concrete to plant the trees. The trees have grown quickly, already having reached around 3.5 metres in height. They also look great when in flower, except they only flower once a year & the display lasts for only 3 weeks. Blink & they are gone! 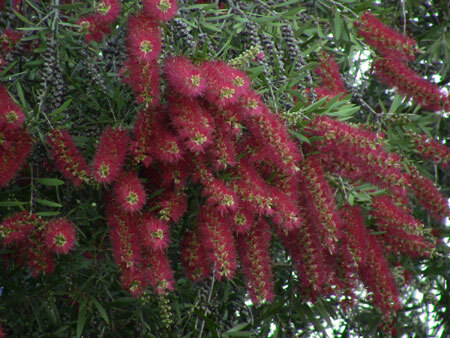 This morning I had a chat with others about these new Bottle Brush street trees with the concern being that the birds & bats ignore them because the flowers are dry. The flowers of the new species of Callistemon are a gorgeous vivid red & bigger than the usual flowers produced by the older Callistemon street trees that are all over Marrickville LGA. These new flowers are all show & almost useless as a food source for wildlife. The same happened to two Grevilleas we planted. We eventually removed them because the birds & bats were ignoring the flowers. We plant specifically to feed urban wildlife so an ornamental tree was not what we wanted, even if it was a native & the flowers were pretty. It was annoying because there is no indication when you buy these trees that they produce dry flowers. We presumed the same happened with Marrickville Council. The nursery told us it was because the trees were hybrids & grafted to specifically produce great flowers. That the flowers don’t produce much nectar & are therefore useless to nectar-feeding wildlife is not considered an issue. It’s a hit & miss. Some are okay, but most end up with ornamental flowers…great for florists. This morning’s chat moved on to wondering how many of these ornamental Callistemon street trees Marrickville Council have planted, whether they will continue to plant this particular Callistemon species in the years ahead & even whether they know that the flowers have little or no nectar. 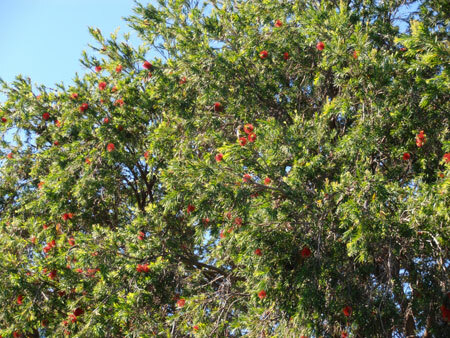 There was great concern that Council will continue to plant this particular Callistemon species with the fear being that the birds & bats will not have enough food in the years ahead when the older Callistemon street trees are replaced. Using these trees would also have an affect on biodiversity now. Someone said, “Imagine no flocks of cheeky Lorikeets chattering away in the trees?” We all agreed. Somehow the sound of these birds lightens our lives.